Duvat, V.K.E., Salvar, B. and Salmon, C. 2017. Drivers of shoreline change in atoll reef islands of the Tuamotu Archipelago, French Polynesia. Global and Planetary Change 158: 134-154. Writing as background for their study, Duvat et al. (2017) state that "it has commonly been considered that atoll reef islands would disappear under climate change, as a result of sea-level rise and induced accelerating shoreline erosion," citing the works of Connell (2003), Dickinson (2009) and McAdam (2010). This perception is based on model predictions, which have been hyped all over the globe, especially among politicians and the media, some of whom demand reparations for small island States who they fear will be forced to abandon their islands within decades. 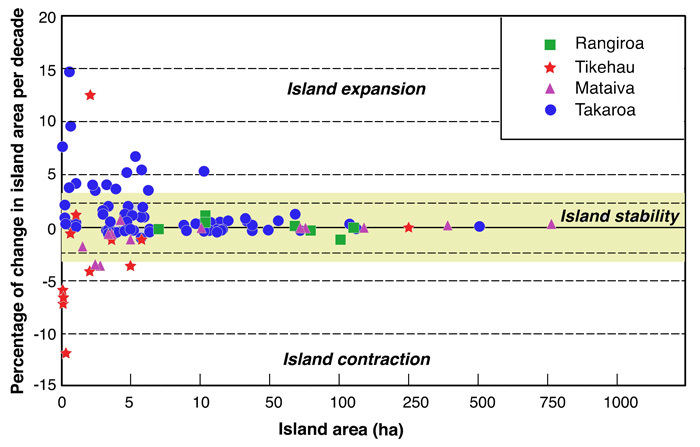 According to Duvat et al., not that much; for as they write in the Introduction to their paper, "recent studies assessing shoreline change over the past decades to century have [now] proved atoll reef island persistence in the face of contemporary sea-level rise, therefore challenging the aforementioned generally accepted idea [of reef island demise due to climate change], citing the works of Webb and Kench (2010), Rankey (2011), Ford (2012; 2013), Biribo and Woodroffe (2013), Ford and Kench (2015), Kench et al. (2015), Testut et al. (2016) and Duvat and Pillet (2017). And thanks to their newest work, the team of three French scientists increases the worldwide sample of atoll reef islands demonstrating this fact (from a shoreline change perspective) by a whopping 30%! As noted by the researchers, their findings bring "new irrefutable evidences on the persistence of reef islands over the last decades." Over the past three to five decades, the total net land area of the studied atolls "was found to be stable, with 77% of the sample islands maintaining their area, while 15% expanded and 8% contracted." Furthermore, they note that 7 out of the 8 islands that decreased in area were very small in area (less than 3 hectares), whereas "all of the 16 islands larger than 50 hectares were stable in area." Clearly, as summarily concluded by Duvat et al., atoll reef islands "are robust landforms." They are not collectively in danger of drowning in the depths of the sea due to climate change. The models have got it wrong and those who rely on the models have got it wrong. Nature is much more resilient than the alarmists make it out to be. McAdam, J. 2010. 'Disappearing states' statelessness and the boundaries of international law. In: McAdam, J. (Ed. ), Climate Change and Displacement: Multidisciplinary Perspectives, pp. 105-109 (Hart, Oxford).